MUMM-RA has a phial of miniaturization gas. VULTUREMAN builds a mechanical WOLFRAT to infiltrate the gas into the Cats’ Lair. The THUNDERCATS are immediately reduced to nine inches high. Knowing how vulnerable the THUNDERCATS are in this state, MUMM-RA orchestrates a MUTANT attack on the Cats’ Lair. 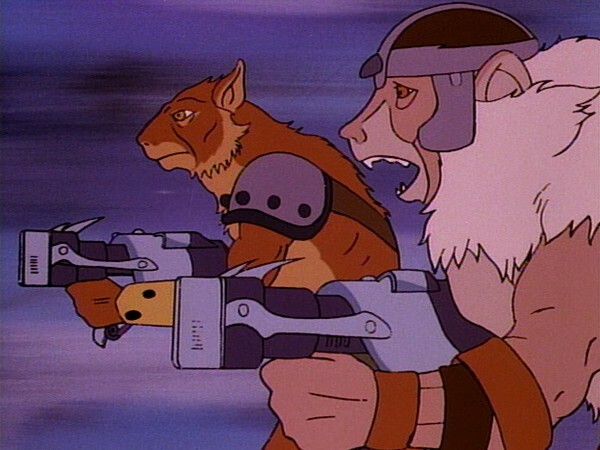 The THUNDERCATS’ only hope is SNARF; they armor SNARF and use him as a battle charger while TYGRA works on an antidote. The THUNDERCATS finally take the antidote, and SNARF, getting an accidental whiff of it, grows to huge proportions. In his gigantic state, SNARF terrifies the MUTANTS and puts them to flight. Sometimes in our minds we may overemphasize the importance of certain physical characteristics. We may feel bad or worry that we are at a disadvantage if we don’t possess a quality. For some, physical size and strength is a desirable trait. But often it is given too much importance. In reality, the lack of a physical quality does not have to be a deficit and it may be counterbalanced by other characteristics. 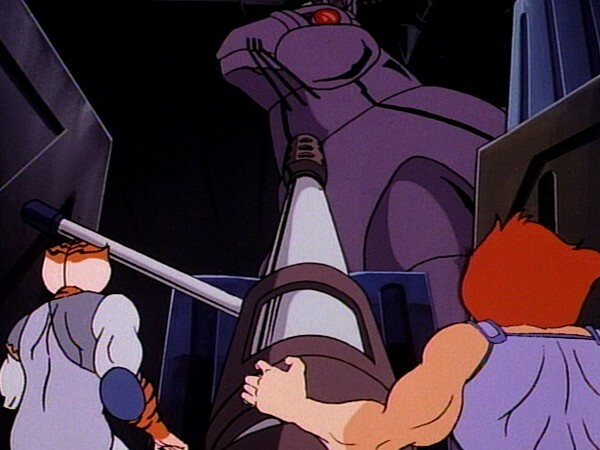 In this episode, the ThunderCats find themselves physically mismatched in fighting the Wolfrat, when they are cut down in size. 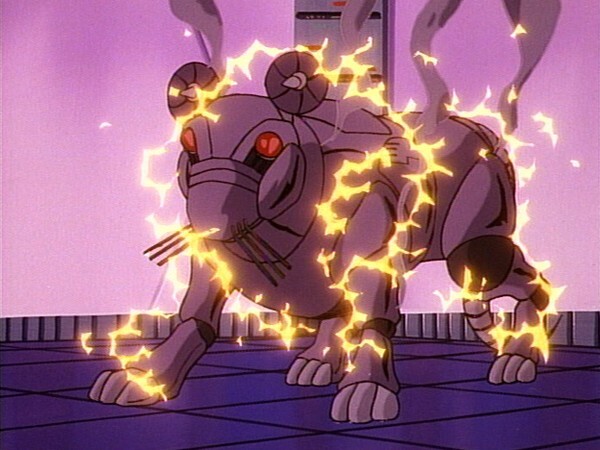 However, they use speed, improvisation, teamwork, and determination to persevere against the robot and the Mutants. The lesson for us is that we must never place too much importance on any one characteristic, but should strive to grow in and use all of our personal qualities. It is our whole personality that counts, not any one trait. Perhaps because of the large number of episodes required to fill an entire season, or perhaps because of the storytelling opportunities presented by the concept in question, within the genre of animated series from the 1980s it’s possible to find a number of recurring themes, for example snow-based episodes such as ThunderCats‘ own “Lord of the Snows”. 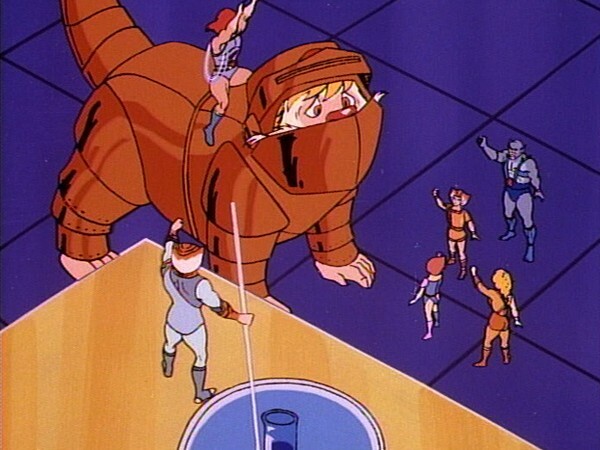 However, without question one of the most popular of these recurring themes is the ubiquitous “shrinking episode”, and this episode is the ThunderCats series’ own venture into the concept. 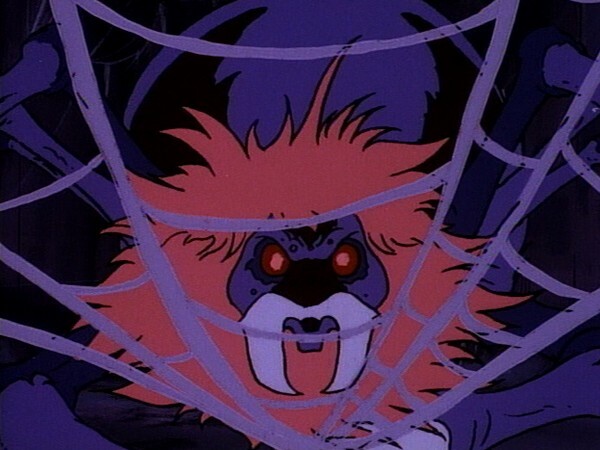 This is perhaps one of the hardest episodes of ThunderCats to assess objectively, simply because, for any fan of 1980s animation, the concept and themes of this episode have all been explored countless times before. In a way, it has to be said that this is a pity, because this episode actually presents a number of unique twists that mark it out from other similar attempts by other series – for, whilst other series may simply create a plot device that shrinks the show’s lead heroic characters and then pits them against a sequence of generally random dangers (such as the newfound susceptibility to being attacked by mice, insects, household appliances, etc. 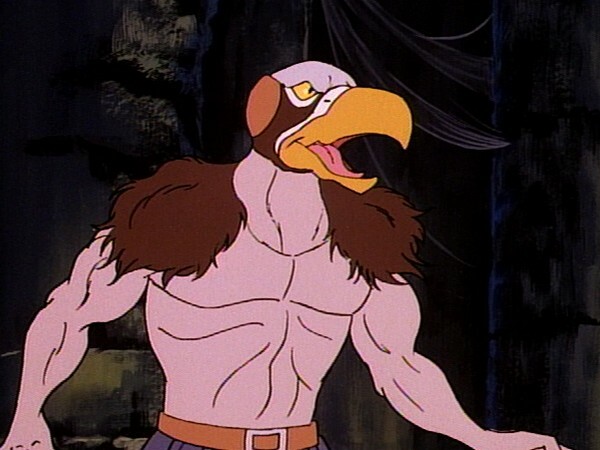 ), in this episode Vultureman and Mumm-Ra’s plan is twofold – by first using the Wolfrat, itself a uniquely innocuous-looking creation, to infiltrate Cats Lair and shrink the ThunderCats, and then using that same creation to attack the miniaturised ThunderCats. This is actually a highly inventive plot device – for, if the Wolfrat were to come up against the full-sized ThunderCats it would barely last a couple of seconds, likewise if a full-sized combatant were to attempt to infiltrate Cats Lair undetected they would be unlikely to meet with much success, but, thanks to Mumm-Ra and Vultureman’s plan, the Wolfrat is theoretically able to accomplish both tasks at once. 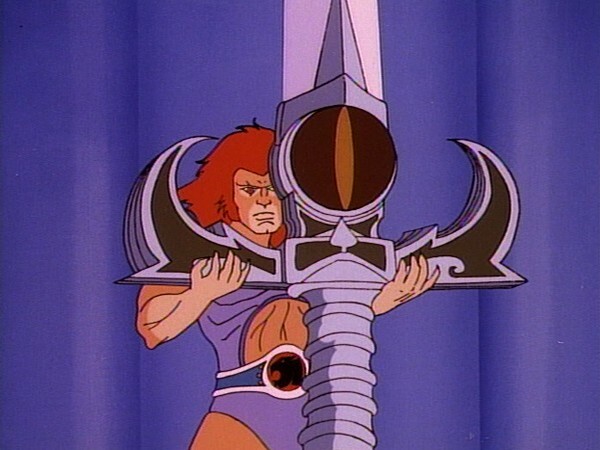 Another thing that makes this episode cleverer than it might initially appear is the fact that it presents a unique method of separating Lion-O from the Sword of Omens. 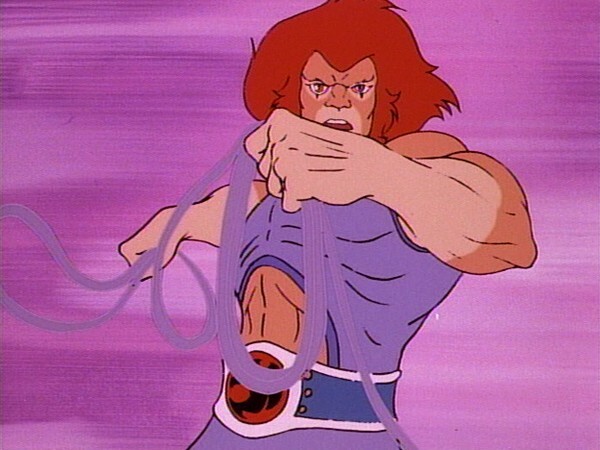 Throughout the ThunderCats series, particularly in the show’s second season, it would become all too easy for any situation to be resolved by the Sword of Omens’ power – in this episode, Lion-O’s reduced size separates him from the Sword, and a whole small action sequence is built around his attempts to reach the Sword Chamber and call on “Sight Beyond Sight”. 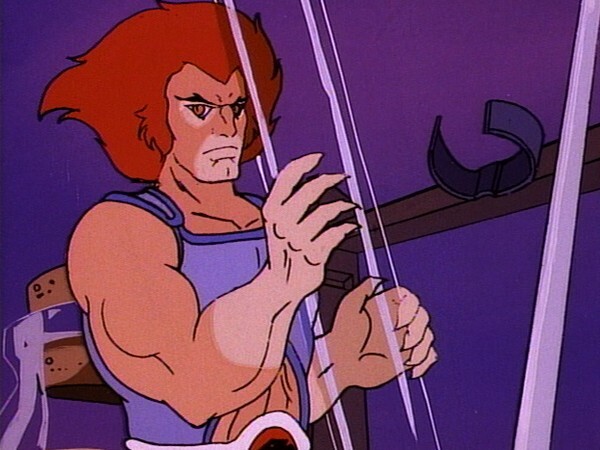 Had Lion-O been armed with the Sword when shrunk, even in his smaller state it would have been relatively easy for him to overpower the Wolfrat, and so it’s good to see this potential plot hole closed. 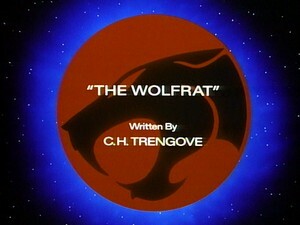 The second script to originate from the pen of Chris Trengove, who had previously made his debut with “Turmagar the Tuska”, the two episodes couldn’t be more different – for, whilst “Turmagar” was built around a variety of memorable action sequences with, at times, very sparse dialogue, “The Wolfrat” is filled with memorable and sometimes witty lines. Perhaps the only recurring theme of the two episodes is Trengove’s apparent fondness for pitting the ThunderCats against a giant creature, albeit in this case the size difference is caused by the ThunderCats being tiny rather than the creature they are facing being huge! Another nice touch when viewing this episode is seeing Vultureman working directly with Mumm-Ra. 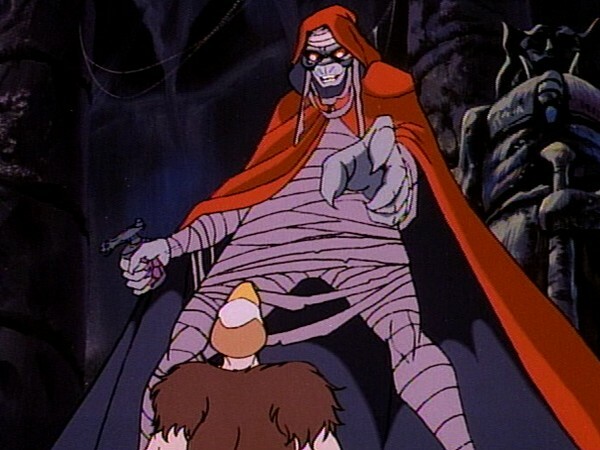 Always the most duplicitous and independent of the Mutants, one wonders whether Vultureman’s alliance with the devil priest in this episode was known to his comrades or whether this was an early attempt by the Mutant inventor to break away from his fellows and establish a direct alliance with Mumm-Ra, who, one suspects, is someone Vultureman would regard as more of an intellectual equal than the other Mutants. Whatever the case, this scenario makes for an entertaining deviation from the norm, where it is normally S-S-Slithe who is shown liaising with Mumm-Ra, and as such adds another unique aspect to this episode. 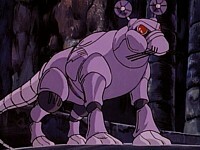 Even when trying to objectively view this episode as if it were the first and only example of a “shrinking episode” ever to appear within the world of animation in the 1980s, it has to be said that this episode suffers from being slightly bland – however, employing the same process, it is also a lot more imaginative and clever than most of its contemporaries, and it serves as a testament to the standard of writing prevalent at this end of the ThunderCats series that such a thoroughly-exploited concept can still provide a solid, entertaining story. On the whole this is not one of the series’ strongest episodes, but still has enough good points to make it worth a viewing. 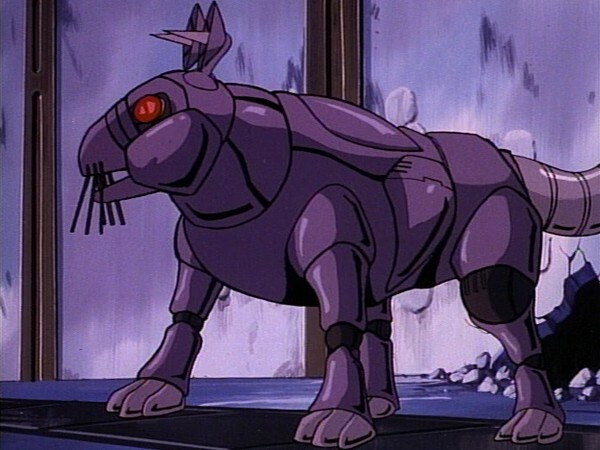 Interestingly, both the name and design of the Wolfrat would indicate that Vultureman has heard of both wolves and rats, despite originating from the Planet Plun-Darr, and with neither animal having previously been sighted on Third Earth! An entertaining in-joke appears early on in this episode, when Mumm-Ra reveals that his magical miniaturising potion was created by “Tutantiny” – pronounced “Tutan Tiny”! This is, of course, a play on the name of the legendary Egyptian pharaoh Tutankhamun. 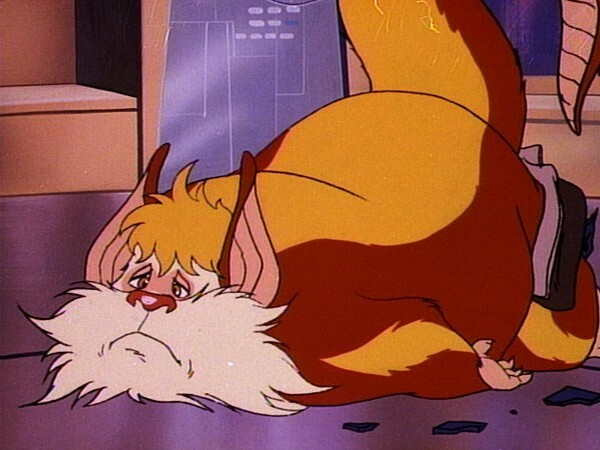 Towards the end of the episode, when Snarf breaks out of the Wolfrat disguise and declares “That’s just for openers, Mutants, Snarf, Snarf!”, through careful listening it’s possible to hear voice actor Bob McFadden actually switch from voicing Snarf to voicing S-S-Slithe, who speaks the next line, at the very end of Snarf’s line! In this episode we’re shown a giant Snarf facing off against the Mutants, with memorable results – a similar plot device would be utilised in season 2’s “Hair of the Dog”, when Snarf transforms into Snarf-Ra, the Ever-Living!